Crowds flocked to Southsea seafront once again for Portsmouth’s annual festival Victorious. 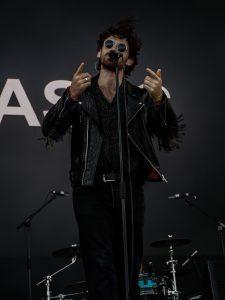 With the Kaiser Chiefs, Paloma Faith and The Prodigy included in a star studded line up, fans were eager for a brilliant weekend and it didn’t disappoint. The Friday night opening party has been a feature of Victorious for two years running and it kicked off with a bang with the Kaiser Chiefs and The Libertines both crowd pleasers. It made up for the unfortunate downpour during the Lightning Seeds and Shed Seven as many fans flocked for shelter. Nevertheless, it didn’t stop festival goers having a good time with huge crowds gathering for The Kaiser Chiefs and The Libertines. Saturday didn’t see an ounce of rain as the sun shone on the seafront. The music matched the weather on all stages as not only were there some huge performances on the main stages but also some brilliant local singers and bands. Acoustic Avenue, White Sox, and Room 10 featured from Portsmouth College giving them some experience in performing to a large audience. As well as this, Mikey Duke hosted his own DJ set in the Soul Circus which drew in large numbers of young people. Portsmouth College hosted a great variety of acts as well as supplying glitter makeup and hairstyles for festival-goers courtesy of HAHA Training. The main acts didn’t disappoint on Saturday night either as Paloma Faith and Paul Weller drew in huge crowds. Other acts to feature on the bill that included Billy Bragg, Everything Everything and Gabrielle Aplin. Sunday saw the weather take a turn for the worse as the rain poured for hours on end. In typical British spirit however, festival goers still came in their thousands to see their favourite acts. These included rapper Example, Years and Years and an electrifying performance from the The Prodigy. Credit must also be given to the many acts from Portsmouth College who still withstood the rain to perform. Thinking Jack, Quays Band and The Peaches all braved the storm and showed that a little bit of rain won’t stop young musicians doing what they love. 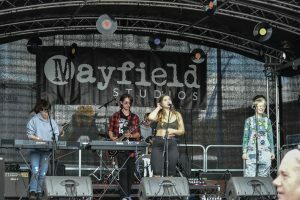 As well as showcasing their terrific musical talent, Portsmouth College also handed out opportunities for students to gain vital work experience to enhance their career prospects. Students were chosen as photographers and journalists so they could gain practical experience of their chosen field. Keep an eye out for photos and articles all produced by the students themselves.